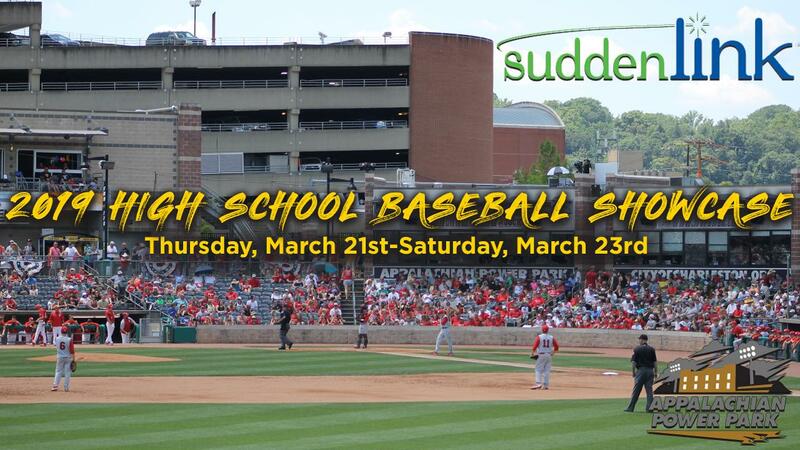 The 2019 Suddenlink High School Baseball Showcase runs from Thursday, March 21, through Saturday, March 23 at Appalachian Power Park. CHARLESTON, W.Va. (March 20, 2019) - The Suddenlink High School Baseball Showcase returns for a fifth year at Appalachian Power Park, beginning Thursday, March 21, and running through Saturday, March 23. Several of the best high school baseball teams from West Virginia will descend to the Kanawha Valley for the weekend showcase hosted at Charleston's premier downtown facility. Returning from last year's showcase are Capital, Charleston Catholic, Clay County, Herbert Hoover, Hurricane, Nitro, Notre Dame, Ripley, South Charleston and Summers County, while Braxton County, Cabell Midland, Parkersburg South, Point Pleasant, Sissonville and Wayne fill out the rest of the showcase roster. The West Virginia Power opens its 15th season, and first as an affiliate of the Seattle Mariners, on April 4 in Greenville, S.C., with the home opener slated for April 11 at Appalachian Power Park. The 2019 South Atlantic League All-Star Game is set for Tuesday, June 18, with a 7:35 p.m. first pitch. For tickets and more information on the 2019 season or the All-Star Game, please call (304) 344-BATS or visit wvpower.com.